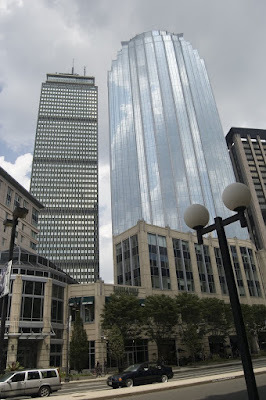 The Prudential Center Tower, or Pru as it is known locally, was completed in 1964 and at 759 feet (229 meters) tall with 52 floors is the second tallest building in Boston (the Hancock Tower is the tallest). Counting the antenna on its top, the tower reaches 907 feet (276 m), which makes it the tallest structure in Boston. 111 Huntington Avenue is sometimes referred to as the R2D2 building because of its distinctive open dome at its top, which unfortunately cannot be seen from this angle). It is part of the Prudential Center complex and stands at 554 feet (169 meters) with 36 floors. 111 Huntington is Boston's eighth-tallest building and has a prominent place in the city's skyline. It won the 2002 bronze Emporis Skyscraper Award.